Robert Carl Janton was born the only child of Fritz Carl and Verna Josephine (Houchins) Janton on 27 April 1922, in Columbus, Ohio, He grew up there, and attended North High School until he enrolled at Culver Military Academy in 1938. There, he was Captain of the Culver Rifle Team, and Honor Graduate. He married Marcia Roberta Overbeck in 1940, and they were blessed with their first son, Robin C Janton, on 22 September 1942. 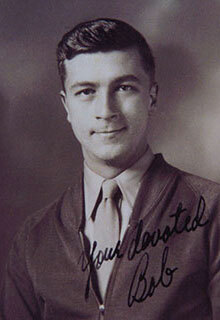 Bob then went into the service in 1943, enlisting as an Aviation Cadet. He earned his wings from primary on 31 March 1943 at Lodwick Aviation Military Academy at Avon park, Florida. But the next step in pilot training never happened. For whatever reason, still unknown, Bob went from Maxwell, to Keesler Field Mississippi, for mechanical training on the B-24. Graduating at the top of his class, he was assigned as Crew Chief in the new "premier" 492nd Bombardment Group, forming at Alamogordo, N.M.
At Alamogordo, he received his first B-24, which he named SUPER WOLF. His good friend, "Tug" Smiley, also from Columbus Ohio, was assigned as pilot and crew captain. With a brief delay on the "Southern Route" to England, the war began for Crew Chief Sgt Janton. A total of (19) missions on SUPERWOLF was culminated by its loss over Bernburg, Germany on 7 July 1944. Within a week, Bob had a new plane. This was to be called BROAD + HIGH after the main intersection in Columbus Ohio, his home town. He personally painted the nose art on this aircraft, as he had on SUPER WOLF. When the 492nd Bomb Group was restructured on 7 August 1944, Bob was sent, along with all of the 859th Bomb Squadron to another base, at Rackheath, England. BROAD + HIGH was lost on 18 August 1944 when fuel ran low and battle damage was excessive. Over the next months until the end of the war, Janton was promoted to Master Sergeant and had as many as five (5) aircraft assigned to him as Crew Chief, simultaneously! His record of (total 188) NO ABORT missions on his aircraft stands alone at the top of the MIGHTY EIGHTH in England, WWII. After the war, Bob and Marcia had another boy, named Michael Morris, born 20 January 1947. Bob then became an architect, designing homes in the elite section of northwest Columbus, Upper Arlington. Bob died unexpectedly on 11 June 1967 at age 45, of a heart attack. His only wife, Marcia, passed away in 1993, but their legacy of two, Robin and Michael, continue today. The anecdote to history is now complete; Master Sergeant Janton, who chiefed (7) aircraft in England on the two bases, has been awarded by the President of the United States, THREE BRONZE STAR AWARDS to recognize the 188 total missions he achieved on his aircraft WITHOUT MECHNICAL ABORT. This medal was awarded to M/Sgt Janton posthumously by his Squadron Commander, (Maj) John J Taylor to his eldest son, Robin, 60 years after the accomplishment was made, at the 492nd Bomb Group Reunion, Tucson, Arizona on 22 May 2005.